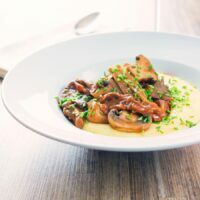 This rich mushroom ragu recipe is the perfect vegetarian meal and is served on a wonderfully comforting cheesy Gruyere polenta. 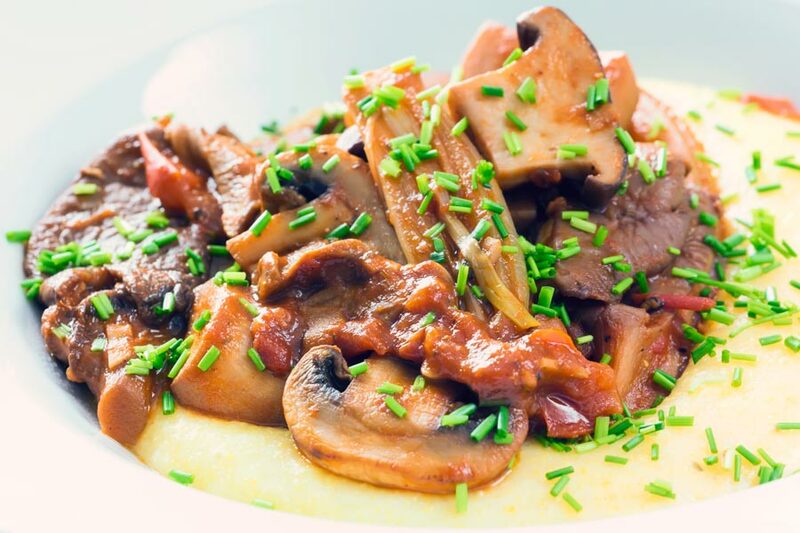 Mushroom Ragu With Cheesy Polenta. My wife has been bending my ear for weeks to come up with a new dish to serve over polenta and this vegetarian Ragu is the sign of my capitulation. To be honest she started hinting in the height of summer. She just lurves polenta! Her favourite way to eat it is with a simple rich ragu like my sausage ragu. 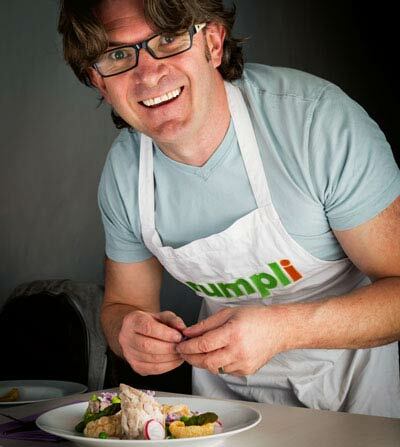 I have however been all very meaty of late so have been playing around with a few vegetarian recipes. Recipes both new and old. 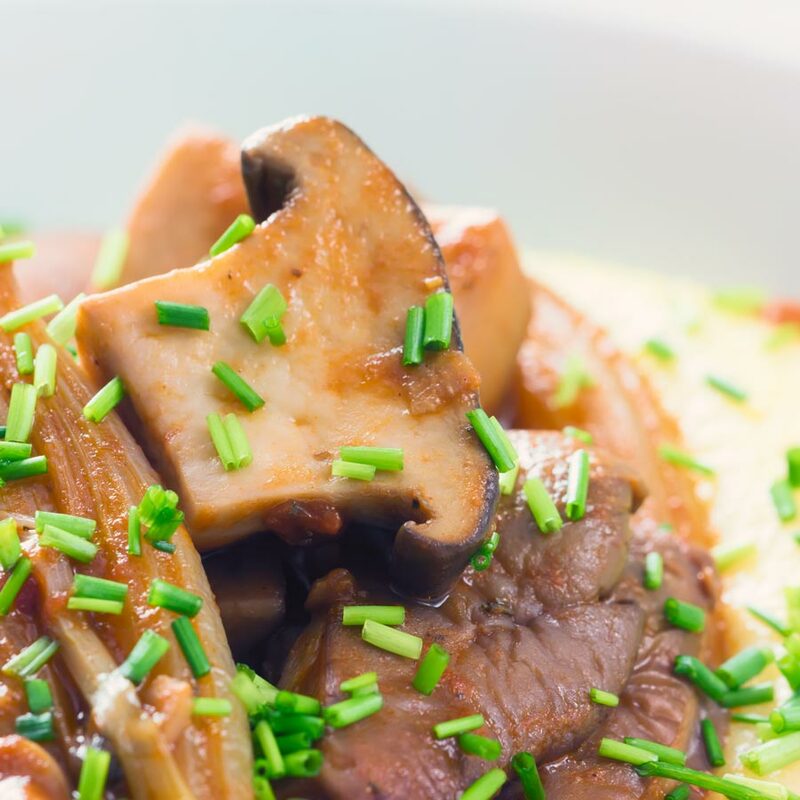 Mushrooms are an ideal ingredient to turn into a ragu, they are hearty and boldly flavoured. They also have a texture I love when they are slowly cooked. Yes, the shrooms in this ragu are very mushroomy! If that is not your thing then this is definitely not for you! What Mushrooms To Use To Make A Ragu. My honest answer to this is all of them. Seriously mix and match to make up the weight. Chestnut mushrooms, oyster mushrooms, portobello, button, it will just work. Porcini mushrooms would be amazing but they are pricey, so I use dried porcini mushrooms. Make sure you use the steeping liquid too as it add such a big flavour. Some varieties of dried mushrooms will leave a little grit in the steeping liquid. It is best to check this and strain if needed, the brand I use is always squeaky clean. One thing to avoid in this recipe is frozen mushrooms. I love frozen wild mushrooms and use them in a few dishes, most notably my cream of wild mushroom soup. But they do have a pretty high water content, which does not work in this recipe at all. I’m pretty sure my wife likes polenta because it gets me out of her hair for a while. As far as I am concerned polenta, just like risotto, benefits from being worked. You need to be around and give it a tickle with a wooden spoon every 5-10 minutes. I find the process very cathartic and relaxing probably because much of my cooking is done with a glass of wine and some good music. The process is simple and nothing more than an ability to stir is required. I would love to see polenta become a little more popular. 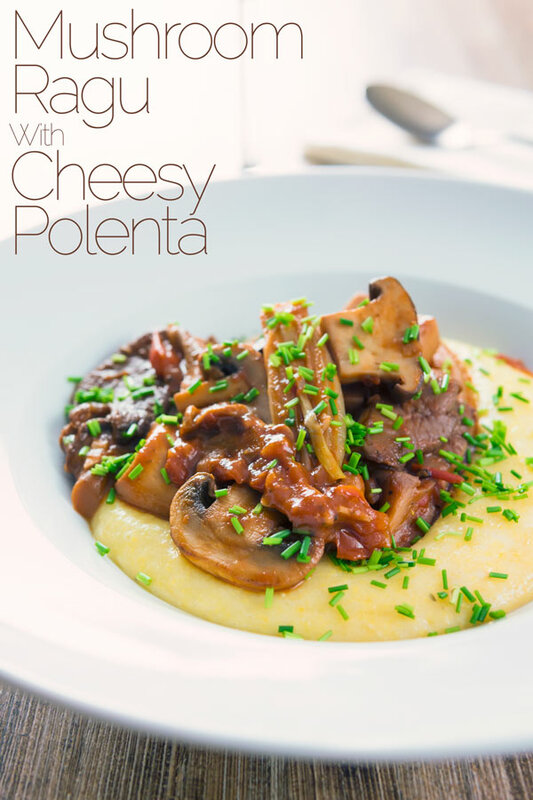 It is really versatile and I am just as likely to whip up polenta as I am mashed potatoes. If you want a little inspiration of other dishes I pair with polenta you should check out my beef osso bucco recipe or my beer braised meatball recipe. 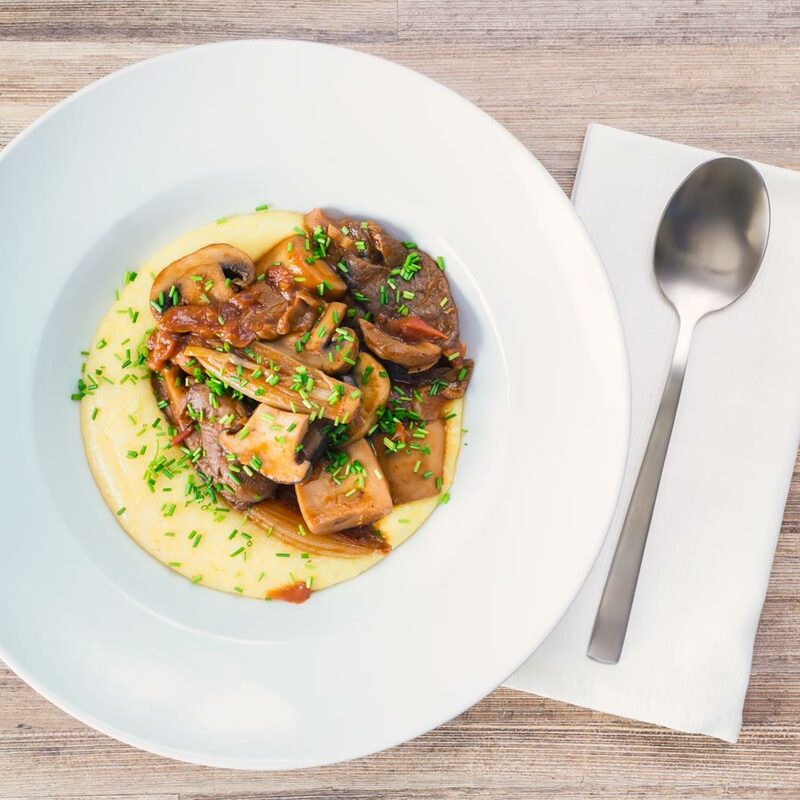 Can I Serve This Mushroom Ragu With Something Else? I am tempted here to scream no, but that would be childish. So… No! Just kidding this ragu would work wonderfully with some pasta because let’s face it ragu and pasta! But what pasta would I choose? Well, my first choice would be something big and strong so Orecchiette would be my first suggestion. But moving on from that it would also work really well with some fettuccine. Essentially any pasta with a lot of surface area, the sauce is too thick to work well with things like penne. You know how else I like to serve this… Just dished up on top of a crispy baked potato with some of the nutty Gruyere cheese on top! Begin by taking your dried mushrooms and add 100ml of boiling water and allow to steep. Heat a pan over a medium heat and when warm add half of the oil. Remove the skins from the banana shallots and either cut in half or cook whole for 15 minutes until nicely coloured. Take your mushrooms, I used a mix of oyster mushrooms, french horn mushrooms and button mushrooms and cut them into 4-5cm chunks. Finely slice the garlic cloves. Remove the onions from the pan and add the remaining oil and turn up to medium high. When hot add the mushrooms and garlic, season well with salt and pepper and then fry until golden. This should take about 10 minutes. Pour in the wine and reduce by half. When the wine has reduced add in the tomatoes, tomato puree, shallots, thyme and bay leaf. Finally, add in the soaked mushrooms along with the poaching liquid and cook on low for an hour. Stir occasionally and about halfway through the cooking do a taste test and add more salt if required. After the mushrooms have been cooking for 15 minutes bring the stock for the polenta to a gentle simmer. Pour in the polenta as you stir to form a smooth paste. Once the polenta comes to a gentle bubble turn the heat down as low as you can and cook for 40 minutes, giving it a stir every 5-10 minutes but make sure it does not catch on the base. Add the cheese to the polenta and stir until it melts, between the cheese and the stock you should not require any salt but taste just to make sure. Serve the ragu over a good dollop of polenta. 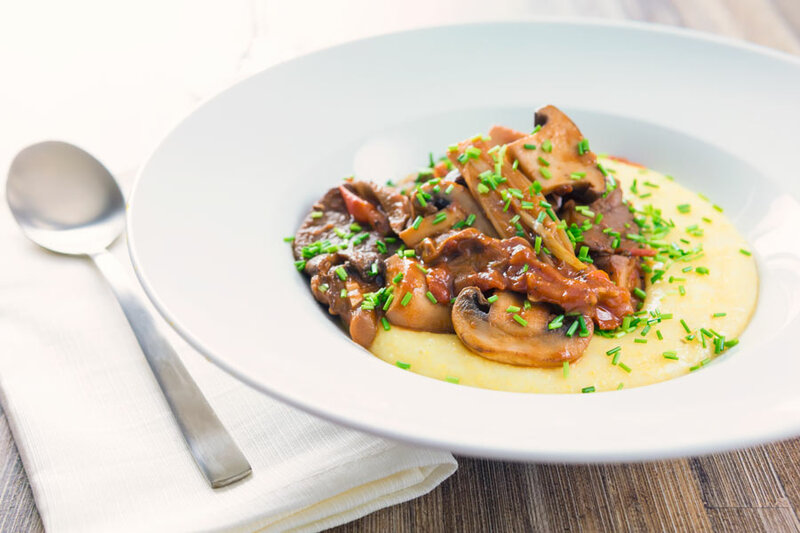 Polenta and mushrooms are a dreamy combination of ingredients. I always love using a mix of mushroom varieties. Looks/sounds divine. I’m in! Cheers Valentina, this is a corking recipe, cooking the mushrooms slowly helps drive of the liquid and makes them super shroomy! Yes I’ve been playing with “dry” polenta recipes in recent weeks, it is super tasty. This looks amazing! I’m not a huge fan of mushrooms but my hubby is. And with the right flavoring I can still eat them. I can’t wait to try this!